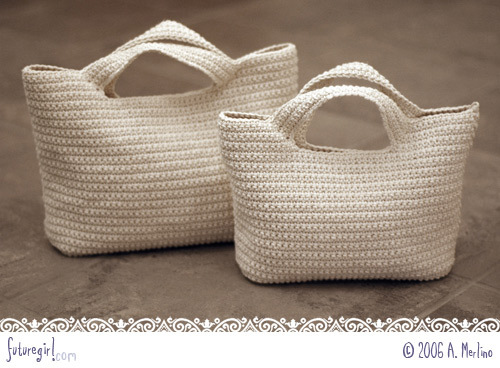 The pattern for the Starling Handbag is now available on the free downloads page. The tiny bird bag is all grown up. I've been crocheting up a storm. The large bag is 13" across at the top, 7.5" high to the bottom of the handles, and 3.5" deep across the flat bottom. The medium bag is 11.5" across at the top, 6" high to the bottom of the handles, and 3" deep across the flat bottom. I'm working on a small version right now. They'll be like a set of Russian nesting dolls. I like how the flat bottom helps create a roomy interior. I bought some stiff interfacing to use on the bottom of the lining to help keep the bottom flat, at least when you set the bag down. That's the plan anyway. I'm not sure how well it's going to work. I wanted a more angled handle on these bags, instead of the slit handles you see on my smaller bags. These angled handles turn at the top so, where you hold them, they lay flat. I figured out a way to do it as I crocheted, though, so I wouldn't have to attach the handles. I've become completely obstinate about the whole 'not wanting to join crochet pieces' thing. I've spent a ton of time crocheting bits and pieces just to figure out how to make a seamless bag or an integrated turned handle. Intellectually I know that I could be spending that time perfecting my joining skills, but I *absolutely do not* want to join crochet pieces. Just thinking about doing it makes my face scrunch up. The side-benefit of my willfulness is that when I finish the last stitch of the bag, I'm done. Well, except for the lining. It's great to clip the yarn, weave in the end, and have a bag sitting before me. I guess I'm crazy like a fox.